On December 3, 2014, November Class and Component prices were announced. 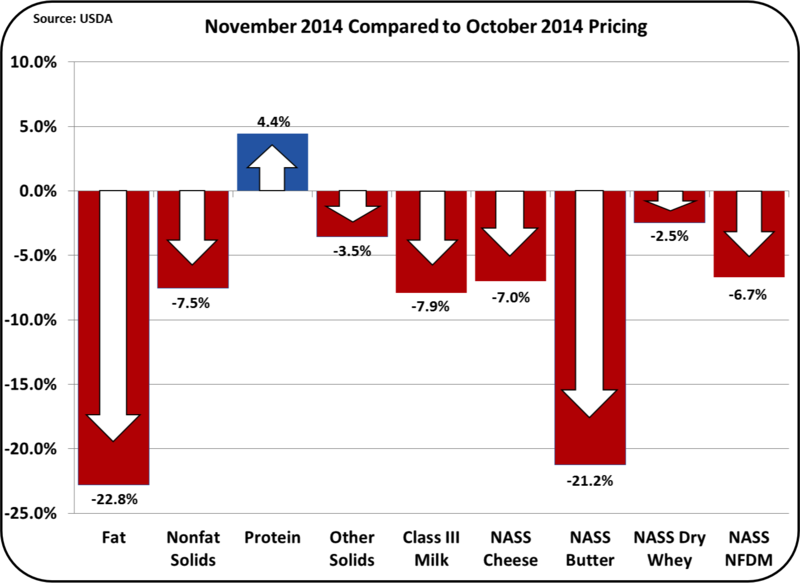 All underlying commodity prices that impact milk component prices fell. 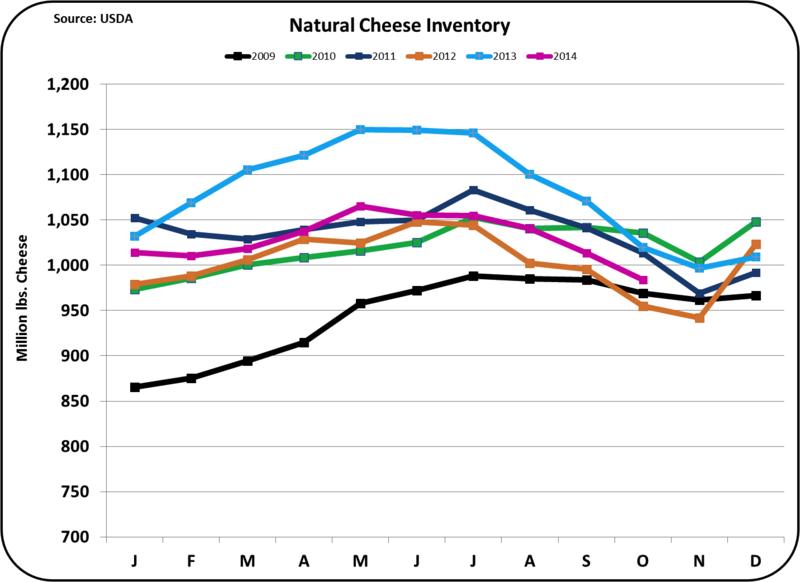 Cheese prices fell 7%, butter prices fell 21.2%%, dry whey fell 2.5%, and Nonfat Dry Milk (NDM) fell 6.7%. Class III milk prices fell 7% to $21.94, a lower but still excellent price. As shown in the "INVENTORIES AND PRICING" section below, inventories of these commodities do not show anything out-of-line. However, the CME futures market is portraying a coming broad price drop in these commodities. Exchange rates are showing a significant strength in the USD which adversely impacts exports. New export data is not available as of this date, and will be published in this blog as soon as it is available. Dairy solids exports are hovering near 16% of total dairy production. With this large and volatile export market, exports can drastically effect domestic pricing of dairy products. The most major drop was in the price of butter, falling by $.54/lb. which equates to a 21.2% drop. This drop has been widely anticipated as the record high prices for butter were unsustainable. The one positive number on the dashboard above is the price of milk protein. 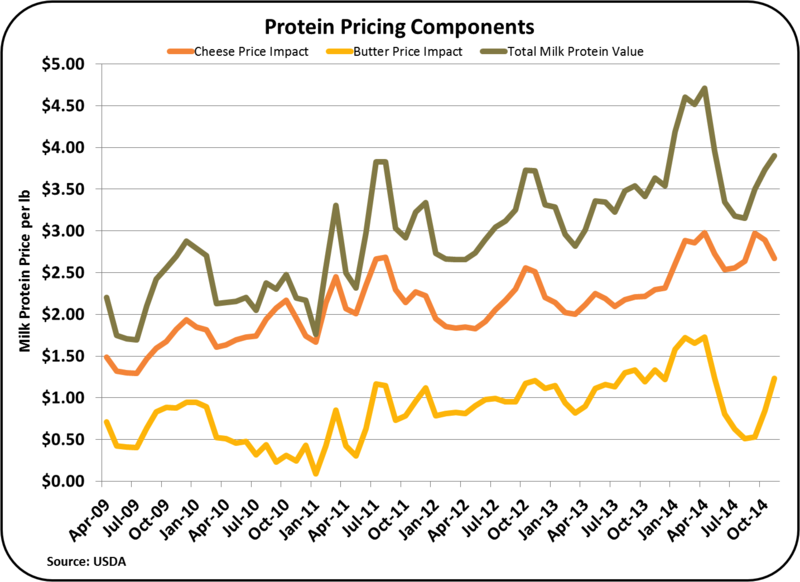 Milk protein is up only because of the significant drop in the price of butter. The price of milk protein is based on the price of cheese plus an adjustment for the higher value of butterfat when used in cheese rather than butter. Those elements of the milk protein price are shown in the chart below. Long term component price trends are returning to more normal levels, with the value of milk protein once again well above the price of butterfat. Protein at $3.90/lb. 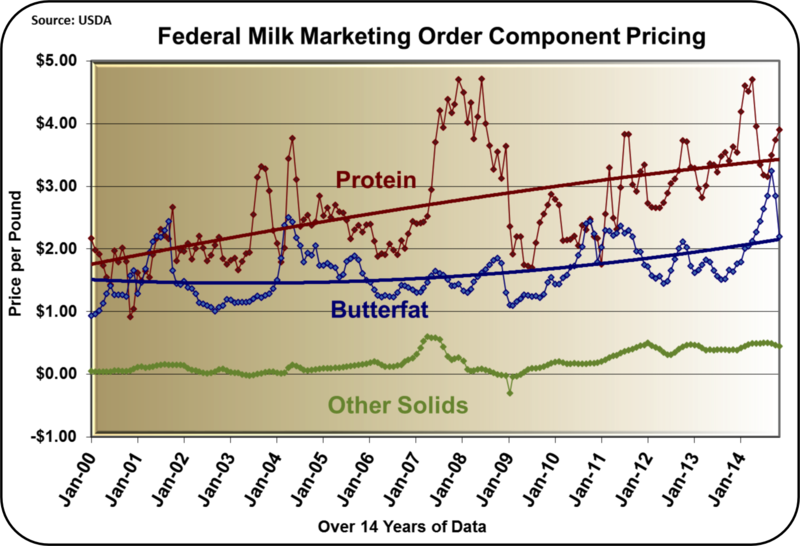 is 77% greater than the current price of butterfat which is $2.20/lb. 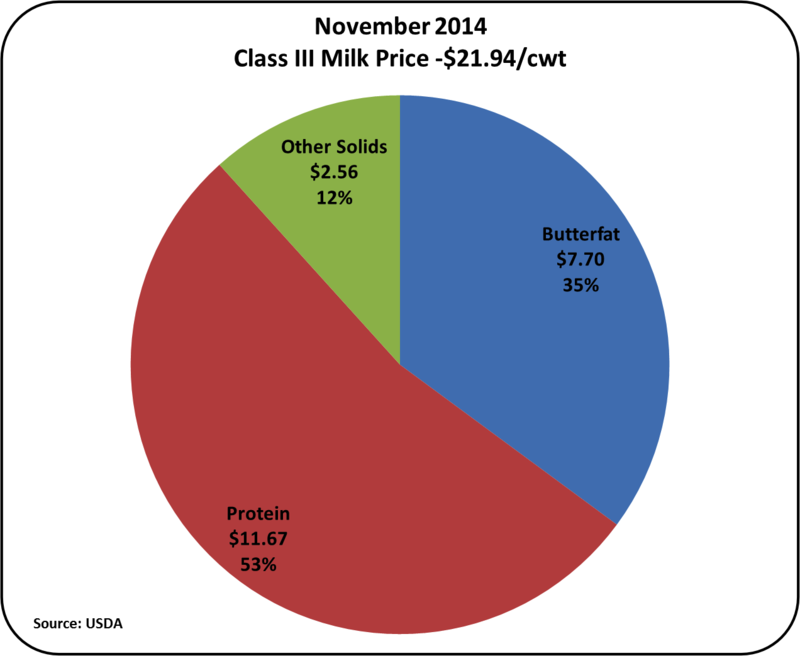 The pie chart of producer revenue below is based on the November component prices and the USDA standards of 3.5% butterfat, 3.0% protein, and 5.7% other solids. Once again, payment for protein is making up the majority of the milk check. Typically, low component prices are the result of high inventories of the commodities that are used to calculate the milk component prices. 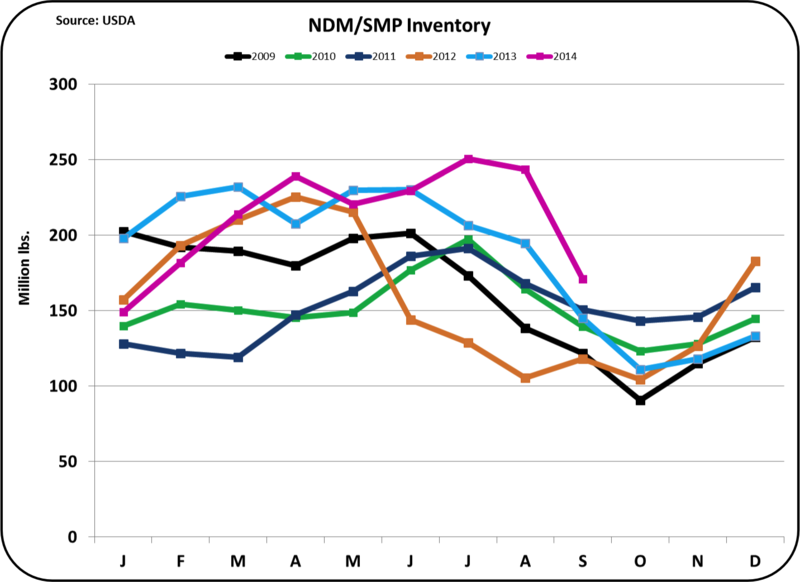 However, these inventories are not significantly out-of-line as shown below. Therefore, the lower component prices can only be attributed to events that could cause the future inventories to balloon. 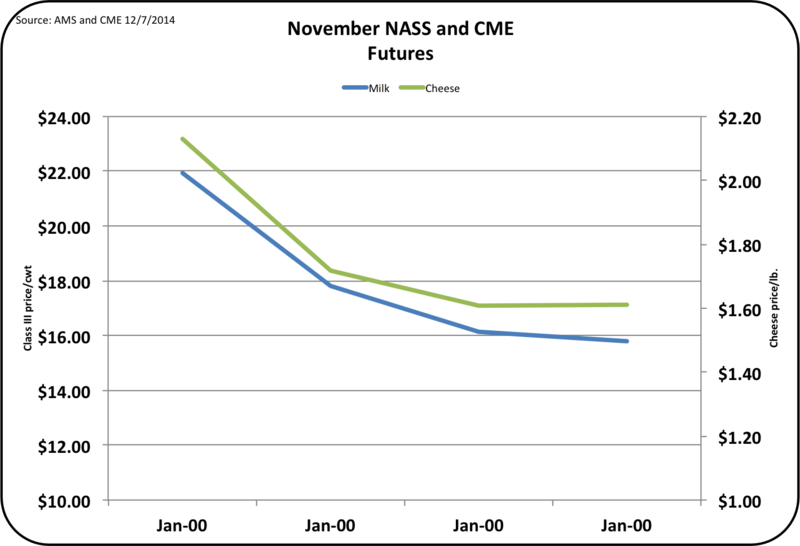 However, the current NASS price of cheese is falling and the CME futures price of cheese is also falling. 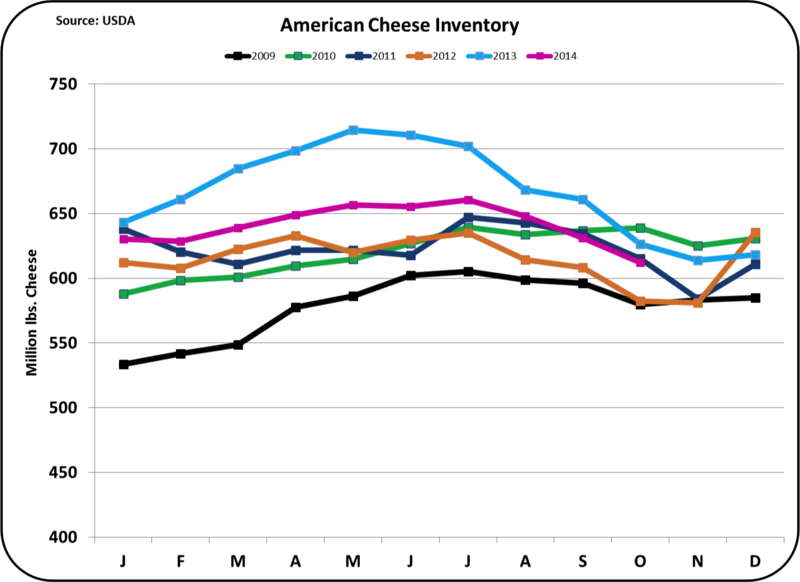 The average November price of cheese fell $.16/lb. or 7%. In 2014 there have been record high prices for cheese and the current price is still a relatively high price. 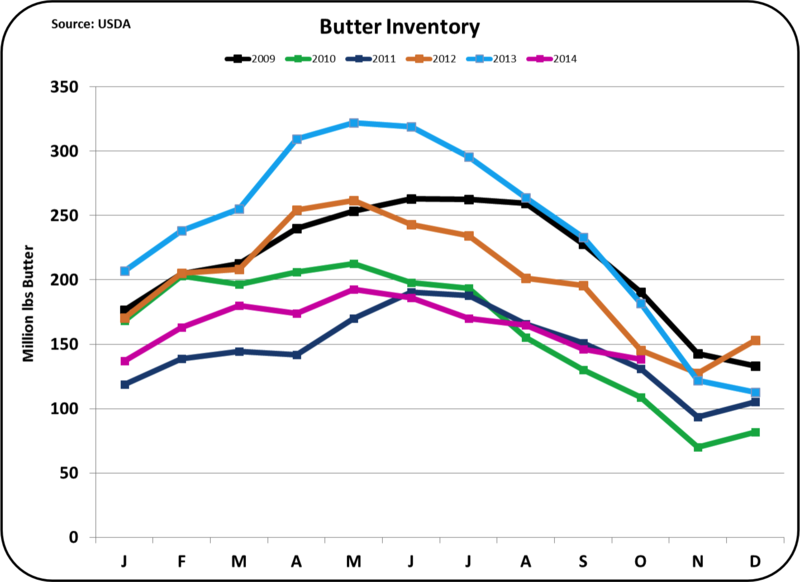 Butter inventories remain low, and below the four prior years of inventories for the end of October. These inventories also do not provide a reason for the lower prices. Strong exports in late 2013 and early 2014 caused inventories to shrink. Production of butter has not increased from historical levels to allow recovery of these inventories. However, exports have dropped recently, and this may be creating an expectation of increasing future inventories. The price of butter has seen a significant drop from the recent record high levels. 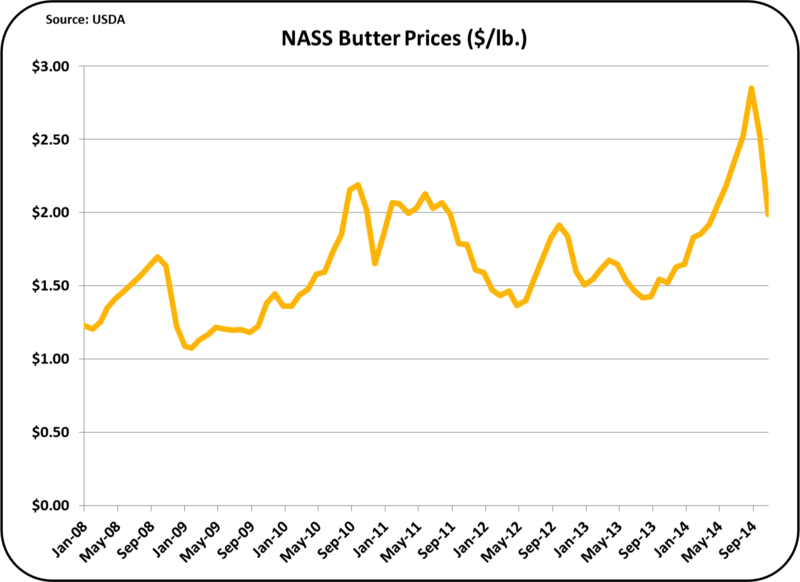 The current NASS wholesale price of butter at $1.99/lb. is still a lofty price compared to historical prices. The September extreme record price ($2.85/lb.) was an abnormality, that in hindsight appears to have been irrational. 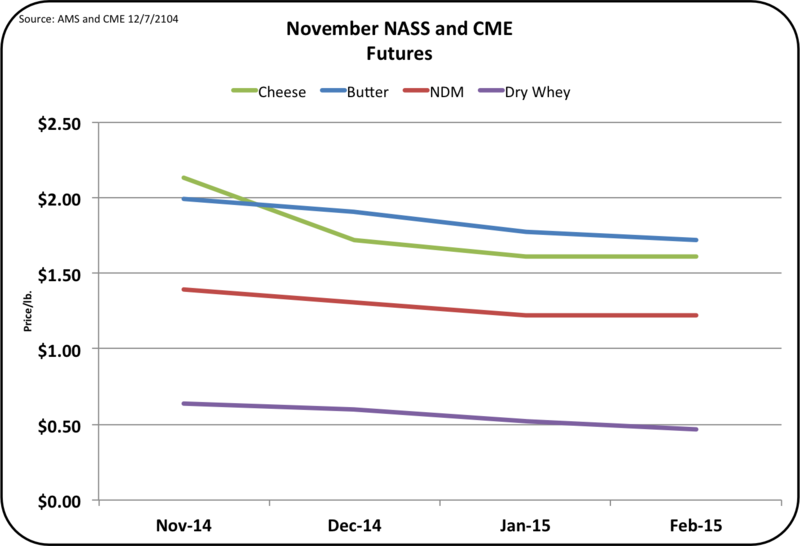 Inventories of Dry Whey and Nonfat Dry Milk are also both in reasonably good shape as of the end of October. Dry Whey and NDM are both primarily export commodities. 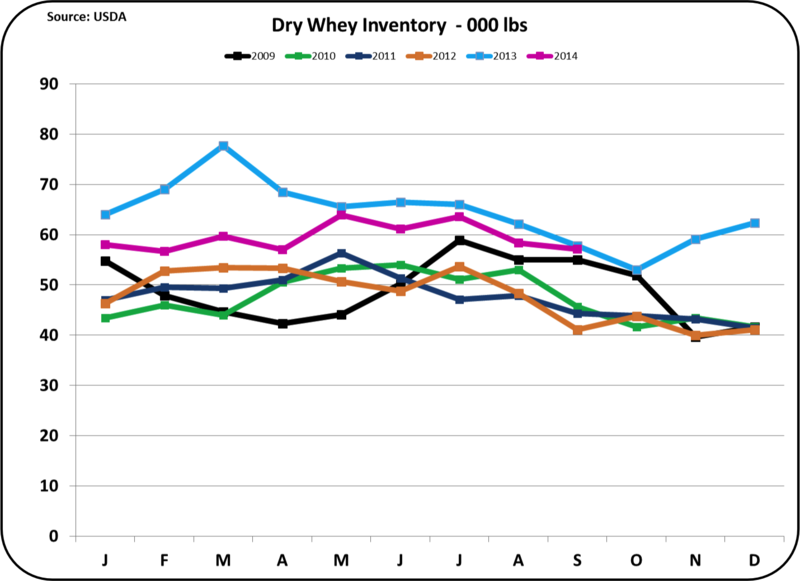 Through September 2014, 60% of Dry Whey production has been exported and 56% of NDM production has been exported. Pricing for these commodities is tied to international prices, and both are falling. Although the above inventories do not indicate that price declines should be expected, the CME futures prices are showing a significant price drop. The green line representing the price of cheese in the above graph shows a significant drop in cheese prices in December. 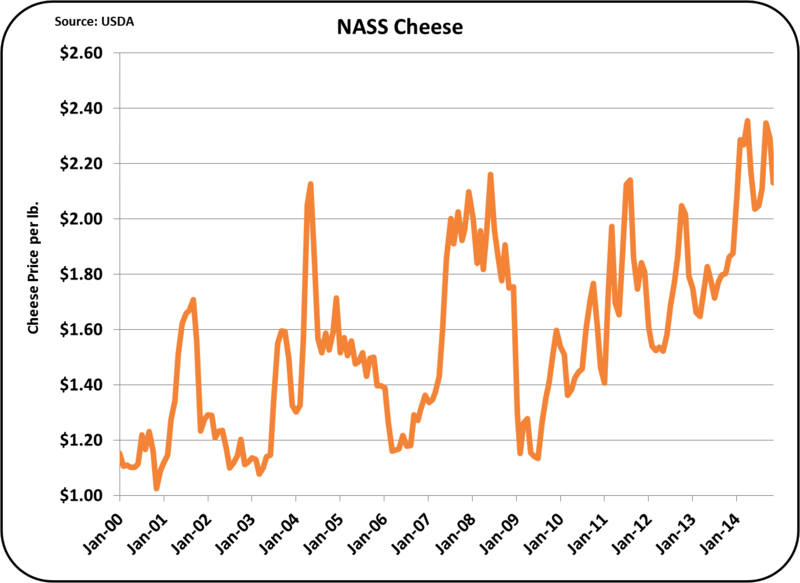 Cheese and Class III milk prices are highly correlated. The chart below shows that the CME futures are maintaining this close correlation. There is only one justification for the decline in the futures market pricing for dairy products. The strong USD is expected to decrease export sales and thereby increase inventories and decrease prices. When new data on exports is available, a new post to this blog will show the more current data on exports.